Antonio Geronimo was an 18-year-old artisanal miner who scoured the red earth for rubies in Namanhumbir, in Mozambique’s northeastern Montepuez district. 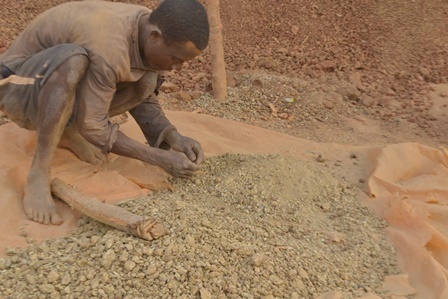 His family relied on mining for their livelihoods. He was fatally shot in April last year, allegedly by the government’s security agents, while he was mining. “My son was shot by the men of Rapid Intervention Force,” says Geronimo Potia. 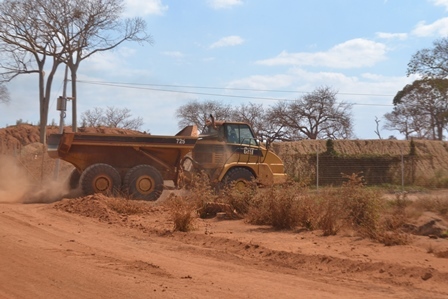 Guards protect the ruby resources for the mine’s owner, Montepuez Ruby Mining (MRM) – a joint venture between United Kingdom-based company Gemfields and its Mozambican partner, Mwiriti Limitada. Forty percent of the world’s rubies are expected to come from this 336km2 concession. Only Montepuez Ruby Mining is permitted to produce and sell rubies from this region. 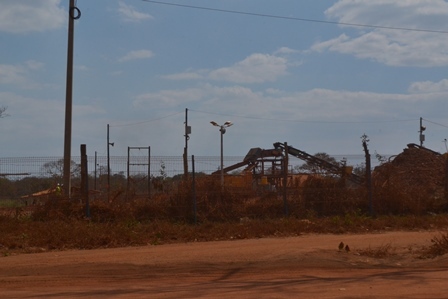 It is a lucrative investment: the company holds an exclusive 25-year mining license over the area, granted by the Mozambican government in November 2011. The Johannesburg-listed Pallinghurst Resources, a mining investment group, is Gemfields’s largest shareholder. In turn, the group’s largest shareholder is South African retail billionaire Christo Wiese. Pallinghurst is chaired by South African Brian Gilbertson, a former BHP Billiton chief executive. Gemfields’s chief executive, Ian Harebottle, is also South African. Wiese, Pallinghurst and Gilbertson did not want to respond to questions about Montepuez operations. Montepuez began operations in this ruby deposit in 2012. By October last year, the operations had yielded the company’s 75% majority shareholder, Gemfields, more than US$122-million in revenue at auction. Gemfields, a world leader in gemstones, formed Montepuez Ruby Mining in partnership with a number of powerful individuals in Mozambique’s ruling Frelimo party. Samora Machel Jr, the son of Mozambique’s first president, chairs the company’s board. The company’s executive director, Raime Pachinuapa, is the son of Raimundo Pachinuapa, a former senior guerrilla commander of Frelimo during its war against Portuguese colonial rule. Gemfields has adopted actress Mila Kunis as its brand ambassador. In a promotional video, she glorifies Gemfields for its ethical approach to gemstone mining. “They take so much pride in how socially and ethically responsible they are. I do believe that they believe it,” she said in a previous interview. Kunis did not respond to questions. With various task forces protecting the company’s interests by guarding the ruby deposit against anyone trying to mine there, the region has been turned into a “militarized zone,” villagers say. 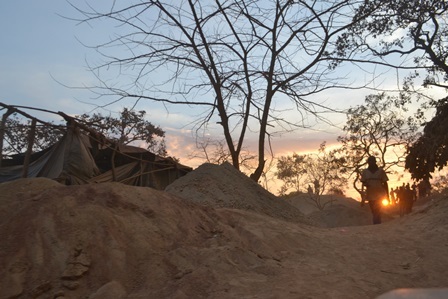 In Namanhumbir, where Antonio Geronimo lost his life in 2014, the Rapid Intervention Force (FIR), part of the Special Forces section of the Mozambican army, helped Montepuez ensure that unlicensed miners did not enter the concession area. FIR agents were equipped with AK-47s. They were recently replaced by another government authority, the National Resources Protection Force. About 35 of its agents patrol the mine carrying firearms. Mozambican police have also been known to intervene in the ruby fields. The provincial police headquarters responsible did not respond to written questions. In addition to state forces, Montepuez uses a private security company, Arkhe Risk Solutions, a Mozambican subsidiary of South Africa’s Omega Risk Solutions. Omega has security operations throughout Africa and the Middle East. Arkhe’s team of 470 security operatives ensures that illegal miners are kept out of the ruby fields. Gemfields says fewer than 3% of Arkhe personnel carry firearms. But locals call the guards nakatanas (men of machete), and claim Arkhe security agents beat them up and shoot at them. Arkhe did not comment on these allegations. Gemfields also employs more than 100 other security personnel who, it says, are not armed. The villagers of Montepuez suggest otherwise. His eyes full of tears, Geronimo Potia recalls how his son was shot and left to die on the red soil of Namanhumbir. His body was carried home by his friends, foreign ruby smugglers, who collected money to pay for the burial and support the Potia family. Potia was afraid to report the killing of his son to the police, believing he could suffer the same fate. Minister of Interior Jaime Monteiro, who is in charge of the FIR, failed to respond to questions. There are other accounts of artisanal miners being shot and left to die in Montepuez territory. Prosecutor Wazamguia said four security officers have been convicted of shooting and killing people on the company’s ruby deposit: one Arkhe employee, two FIR officers and one National Resources Protection Force officer. “In 11 [other cases] we’re still gathering evidence… linked to the police, FIR and the Environment Protection Force, who are all involved in patrolling the mine,” he said. Gemfields’s Harebottle said he did not know about the conviction of the Arkhe employee, but was aware of one shooting by Arkhe staff: “[The shooter] was arrested and after investigation was definitely found to be innocent, because a large group of people were attacking him with machetes,” he said. Langmead acknowledged two incidents “of shooting of illegal miners by security personnel contracted to [the company], including Arkhe”, but said the police had investigated and cleared the accused. She also referred to two cases where FIR agents were convicted for shooting and killing miners; it is not clear whether these were among the convictions listed by Wazamguia. “Gemfields plc categorically denies the inference that it condones or sanctions acts of violence,” she said. Villagers alleged that the nakatanas, “working for the whites”, use wooden sticks to beat them on their knees and other joints so that they can’t work. A teenager said he “was beaten by the whites 20 times on my buttocks with a baton”, and that his friends had to help him walk to hospital. He and others claimed that, when they are caught digging, the guards also take their money and make them clean their office. It is not always clear who the perpetrators are until the investigation has been concluded. Wazamguia believes that Montepuez has a responsibility to investigate alleged incidents on its profitable concession. The company insists it does investigate. A police officer who spoke on condition of anonymity claimed Montepuez has ordered state forces to use “all means” necessary to keep illegal miners away from its territory. In the villages near the ruby deposit, many people recounted incidents similar to the one involving Antonio Geronimo. The Pacores of Namanhumbir lived off the proceeds of rubies their son, Manuel Artur, mined in the area. Manuel was shot on the same day that Antonio died. Fellow miners came to tell his father, Artur Pacore, that members of the FIR patrol had shot his son in the stomach. Pacore said he was too afraid to report his son’s death to the police. Langmead said the company was not aware of the killing of Manuel. 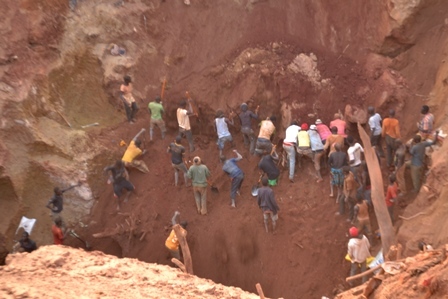 Artisanal miners believe they also face mortal danger from Montepuez’s earth-moving machines. 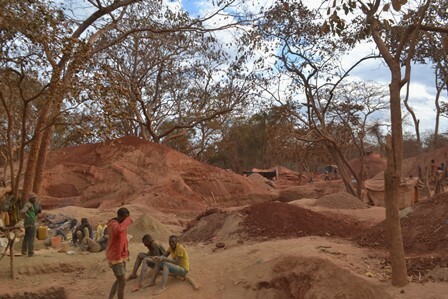 In many places, the Montepuez ruby concession is perforated with narrow pits, many more than 3m deep, dug by artisanal miners. Often, it is difficult to tell whether miners are working in them. The instability of the ground causes it to collapse, burying miners alive without the company bearing any responsibility. Wazamguia said: “There is no evidence that the company has deliberately done such things. Without the protection of their own authorities and fearing that they could be killed, hundreds of artisanal miners have stopped trying to mine rubies. They are now mining less valuable garnets in nearby Nkata, which lies outside the concession. Entering Nkata at dusk, there are hundreds of men covered in red dust, carrying pickaxes, returning from work in the garnet pits. The mining area is scattered with excavations of between 3m and 14m deep. He does not want to go back to Namanhumbir. “I was digging rubies inside a hole when the FIR arrived. They told me to step out. When I got out of the hole, one of them shot me in the leg,” he said. Inflicted in July 2014, the wounds where the bullet entered and exited his right leg are still visible. The minister of land, environment and rural development, Celso Correia, and Pedro Couto, mineral resources and energy minister, declined to comment. Before beginning operations in Mozambique, Montepuez Ruby Mining promised benefits to local residents and laid out a corporate social responsibility program. But people claim many of its promises have not materialized and accuse the company of “legalized land grabbing”. But Gemfields says it has done more than any other company would have done at such an early stage in a large-scale operation of this nature, emphasizing its commitment to corporate social responsibility. It points to another school it says was built, the installation of lighting, the distribution of chickens to villagers and other projects. She confirmed that structures have been burned, but denied the company played a role. She blamed the destruction on conflict between illegal settlers and villagers. Gemfields chief executive Ian Harebottle said the houses of “illegitimate” residents had been torched after they had been forced to leave by the police. “No legal village or legal dwelling has ever been burned down,” he said. Some villagers now refer to Namanhumbir as “El Dobrado”, or “the collapsed city” – a bastardization of the mythical golden city El Dorado. Estacio Valoi is an Oxpeckers Associate. This investigation was partially supported with funding from the African Investigative Publishing Collective in partnership with ZAM magazine, as part of their transnational investigations series.